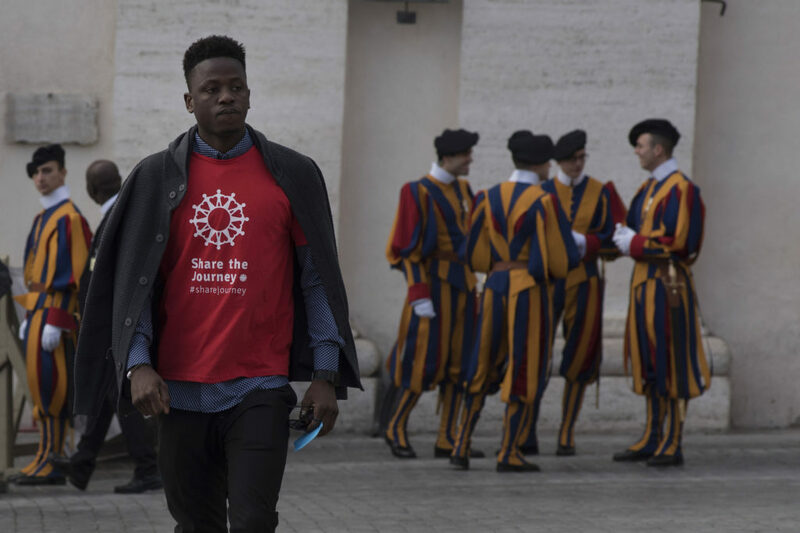 “Hope is what drives the hearts of those who depart,” said Pope Francis on 27 September as he opened the Caritas ‘Share the Journey’ migration campaign. He gave an emotional endorsement for the need to build relationships between migrants, refugees and local communities. Pope Francis warned against what he called “the enemies of hope” as he launched the two-year campaign. A thousand Caritas supporters had travelled from all parts of Italy where they run local projects to help migrants and refugees. Some of those migrants shared Pope Francis’ podium and were able to meet him. The pope made the ‘Reach Out’ gesture – which Caritas is placing at the centre of its campaign – opening his arms out wide. ‘Reach Out’ is the symbol of a concrete mass action of meeting migrants, listening to their stories and sharing their journeys. Supporters worldwide are asked to perform the gesture in a social media awareness campaign. The Caritas campaign is backed by its national organisations in more than 160 countries, by the ecumenical ACT Alliance of over 140 members, by the United Nations agencies the Food and Agriculture Organisation, the International Organisation for Migration, the UN’s refugee organisation, UNCHR and its’ World Food Programme, along with numerous religious and civil society organisations.